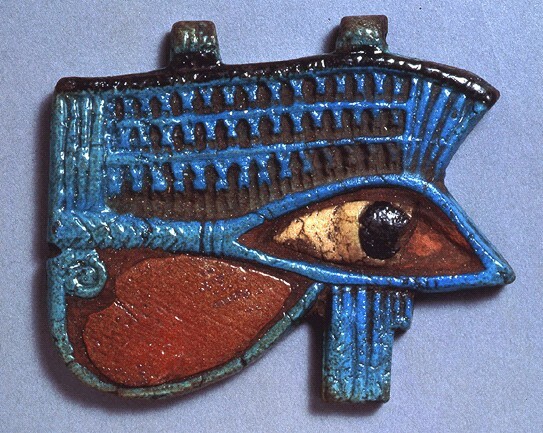 A wedjat eye of polychrome faience: the eye and the highly stylized eyebrow are of blue faience, while the area between the angled bar of the eye and the eye itself is filled with red faience. The cornea and iris are white and black respectively. Some of the larger examples of such amulets exhibit ornate decoration in the exaggerated area between the eye and the eyebrow; in the present instance there are three rows of tiny cats. This large amulet required two rings for suspension at the top. Actual size: Length 8.9 cm; Width 7.2 cm; Thickness 1.0 cm.